"I was born singing. Most babies cry. Or so I believe. I have no one to tell me the truth of it. I was abandoned when I was a month old, left at the Featherbed Inn in the Ayorthaian village of Amonta. It was January 12th of the year of Thunder Songs." The fairy Lucinda has once again given a dreadful gift. This time it's a mysterious magical mirror. The gift is disastrous when it falls into the hands of Aza, who never looks in a mirror if she can help it. In the Kingdom of Ayortha, Aza is most definitely not the fairest of them all. Many spurn her. Many scoff at her. She keeps out of sight. But in a land of singers, Aza has her own gift, one she's come by without fairy intervention: a voice that can do almost anything, a voice that captivates all who hear it. In Ontio Castle, merry Prince Ijori is drawn to it, and vain Queen Ivi wants to use it for her own ends. Queen Ivi would do "anything" to remain the fairest in the land. In this spellbinding tale filled with humor, adventure, romance, and song, Newbery Honor author Gail Carson Levine invites you to join Aza as she discovers how exquisite she truly is. It took me a bit to get into this book. As I got into it I liked it. It has all the elements of a traditional fairy tale. 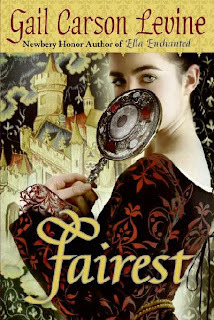 Fairest is the story of Snow White, re-told through Gail Carson Levine's eyes of what really happened. The only thing I didn't like about this book, was how they talked about Aza as being "so ugly". It was mentioned over and over and over. That can't be good for anyone to hear that over and over. It was to centered on "looks." But I did enjoy the book over all, but the looming ugliness of Aza really dampened the story for me. I love Gail Carson Levine, so I wanted to LOVE this book, it just didn't happen.